Can I configure the app to show only products from the same collection? Let's say, for example, that you are viewing a product page which is in the collection 'Hats'. The random recommendations displayed will only be products from the 'Hats' collection. If you have enabled shopping cart page recommendations, recommendations from all collections in the shopping cart will be displayed. For example, if there are two products in your shopping cart, one from 'Hats' and the other from 'Socks', the recommendations displayed in the shopping cart page will be products from either the 'Hats' collection or the 'Socks' collection. In the collection filter only manual collections are used. Automated collections, such as 'Newest', 'Best selling' or 'Low stock', are not used because they usually do not contain similar products. Please note that if there are not enough products matching the selected criteria, the recommendations will be automatically completed using random recommendations. How does the product type filtering work? 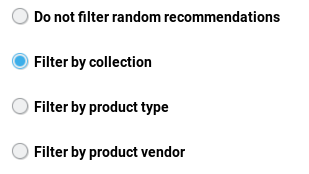 How does the product vendor filtering work?